You can change the color of text and window backgrounds. Change the color of rows, columns, or individual cells. When you have LTP background coloring enabled on the Trading tab in the Properties menu, the Last Prc column colors cannot be changed in the Market Grid. Buy and Sell orders are colored blue and red by default. Selecting new colors using the Formatting option does not change these colors. To change colors this way, disable the Color Code Buy/Sell property from the appropriate tab on the Properties menu. All colors for the Spread Matrix are managed in the Color tab on the Properties menu. They cannot be altered with the Formatting window. If you want to apply the same text and background colors to the entire grid for all windows, select the window area you want to change, or click the top left-hand column heading to select the entire grid. Text colors display in the left palette. Background colors display in the right palette. 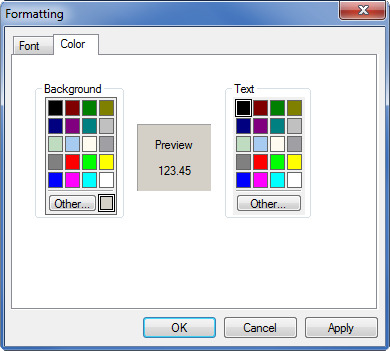 Click a color in the displayed palette or click Other to see additional colors. You can also create custom colors. The color preview window displays the specified colors. To retain these changes, save your workspace.